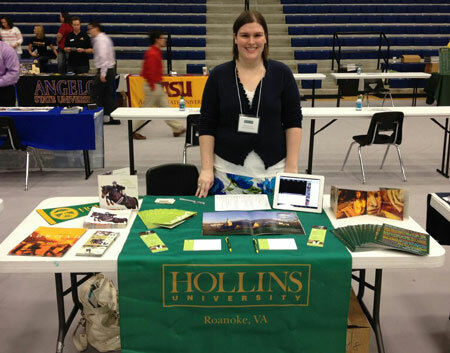 Mariana Denke Lenox ’05 representing Hollins at a college fair in Texas. Alumnae Admission volunteers strive to make sure the best and brightest women in the country attend Hollins. By sharing their own experiences, alumnae volunteers help students get to know Hollins a little better. Alumnae are by far Hollins’ most persuasive and effective recruiters. If your referral is received prior to a student’s admission and she enrolls at Hollins, she will receive a one-time $500 tuition grant. The Office of Admission hosts several events each year for prospective students and their families. We also welcome students to call for customized visits during the week and on Saturday mornings. Our summer programs are another way to give girls a taste of Hollins life. Consider talking with prospective students about applying to Hollins, congratulating them on their acceptance, or encouraging them to enroll. Students in your area who’ve not been able to visit campus may be interested in this option. These are informal meetings with students to answer their questions, tell them about Hollins, and learn about their interests. Sessions typically last about an hour. College Fairs are opportunities for us to share information with prospective students and their families. Fairs normally occur in the fall and spring, usually in the evenings during the week or on Sunday afternoons. Gatherings might be as informal as backyard barbecues, simple desserts and coffee, or dinner at a local restaurant. Events to encourage enrollment are often held in March or April, while “send-off” parties are typically held in mid- to late-August as the students and parents prepare for their first year. Alumnae can encourage creative writing students at their local high schools to consider Hollins by presenting a Hollins Book Award. This award is based on academic excellence and demonstrated interest in creative writing.